Building West Country class 'Bude' in 5" gauge. I grew up in the seaside town of Bude on the Southern Railway's 'withered arm', moving away just after the railway closed; but the memory of the railway there continues to be an influence. When the 60th anniversary of the 1948 Exchange Trials approached, the worthy credentials of the locomotive named after the Town came to my notice, though sadly the locomotive 'Bude' didn't make it into preservation. I had previously admired several other pacifics featured on this site, but had no thought of building one, way too daunting as a project. Through a mix of nostalgia, challenge, and my early memories, somehow I talked myself into starting this huge project, and to tap into the work done by Stefan Owen, (his build described elsewhere). So a part built Speedy I had aquired previously as a future project had to go. How things have moved on since I starting my Q1; materials are mainly metric, and virtually every home has a computer, with the ability to 'search' the web, and to share ideas, information and photographs through web-sites like this; and enabling things to be cut out by machine ! But - computers still don't build locos . . . I realised a good outline drawing would be essential, as there is no published design. The period I have chosen is just after the return from the 1948 Exchange Trials, with revised style cab and lengthened smoke deflectors, still in Malachite livery; quite similar to the commemorative Hornby model, but without the pairing with a black Stanier tender. It was suggested to me that Richard Green could produce a suitable drawing; he has a wealth of Southern loco knowledge and is skillful in drawing using a computer, and he was willing to take on this task. So Richard was commissioned to draw 'Bude' in 1948 guise, and I was able to print off his finished pdf drawings to life size at work. This brilliant professional drawing has been inspirational and extremely useful (elevation view shown above). I started collecting some castings from 'Ariel' in 2008, but also borrowed patterns for the cylinders more suitable for a West Country. This was particularly necessary for the inside cylinder where the piston valves of the 'original' are central above the main cylinder bore; whereas on on the rebuild locos (Ariel), it is offset to one side. These were cast for me by M.J. Engineering - it was quite a heavy box of bits to collect ! Starting to look closely at the detail, I became aware this is a very very different locomotive from the Ariel design, and whilst some smaller items might be usefully adapted, there is really not a lot else in common... e.g. The WC trailing truck is shorter than the Merchant Navy, and wheels are smaller, being the same as the front bogie. As design work was on-going with the loco, I started with the tender chassis. Unlike Stefan, I am building the original 4500 gallon high sided tender, and the chassis is incredible close to the Q1 tender I built previously; but with better information I have tried to be closer to scale with this one. The tender frames are set 6 inches apart, compared with 6 3/16" on my Q1, not that you'd notice; also I've used smaller 5/64" rivets and 7ba bolts for most of the fixings. 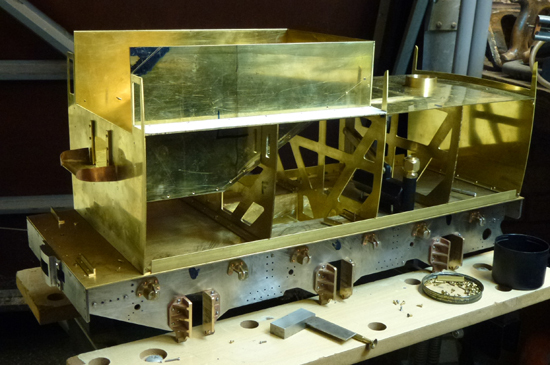 The frames, buffer and drag beam assemblies were cut by water-jet from Stefan's design, the latter being designed to be folded and silver soldered. But significant to Bulleid's design was the use of welding, which I wanted to follow; so I decided to hack these about and re-drew and re-made several pieces with tabs and slots, to allow the components to clip together. I was offered the chance to have these parts tig welded, and I was really pleased with the results. It is a fairly slow process though, needing a sequenced assembly, with a danger of burning through the 1.5mm steel parts, but requires considerably less cleaning after than silver soldering. I was impressed by the results, and have adopted the same assembly technique often, particularly with the many main-frame stretchers. I put myself down for a 'tig' welding course, but it is very trying on one's (my) eye-sight, and requires a steady hand (for small work), and so far this old dog hasn't really mastered it ! In the meantime, the four tender frame stretchers were tabbed and silver soldered, as their joints were straight forward. Disappointed that the tender spring hangers for Ariel (a Merchant Navy) were not close enough to the true outline, I drew out the spring hangers to the West Country design. Stefan was kind enough to model this as a 3D file, which was sent on to Ian Carter. I came across Ian on his stand Impossible Creations Ltd at a show at Sandown. He provides access for the ordinary man to stereo lithography, and from the 3d file, he was able to produce a handed pair of resin spring hangers as patterns for under £10, which arrived in the post. This new industry of '3d printing' is changing how things are made. The resins needed a little cleaning up as the layering process created small ribs, but it was (for me) so much easier than creating a handed pair from solid. The patterns were processed as lost wax castings, and look really authentic riveted to the tender frames. Although Stefan had done a lot of new design work on the complex valve gear, and translating some parts from Ariel, I have been able to contribute to the design work, particularly in the areas of frames, stretchers and smoke box. That said, I am grateful to a number of contacts for helping piece together the inner parts jig-saw; and for photographs, notably from Mike Gipson who let me have a batch of snaps from his own 're-built' research, which have helped enormously. Also an arranged visit to Herston works at Swanage, with my own camera and tape measure provided extra detail. Some parts are starting to be assembled for the locomotive, the frames being 3.5 inches apart, set centrally over the axleboxes. 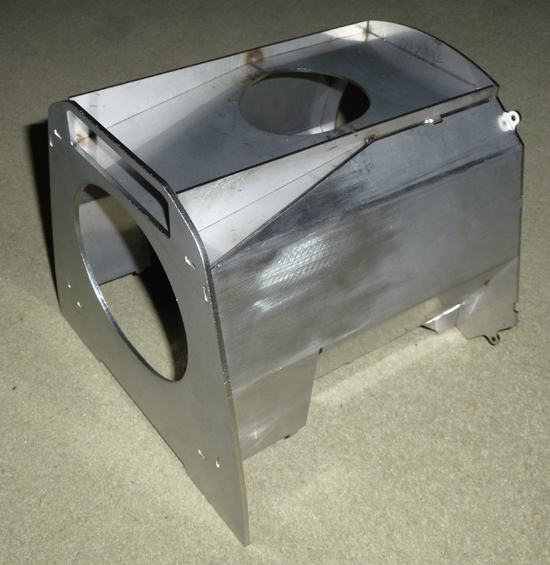 The rear drag box assembly (illustrated) turned out really well from the water-jet cut parts, requiring very little fettling; just a shame I messed up the tig welding on this and a couple of other stretchers and had to have them re-cut ! 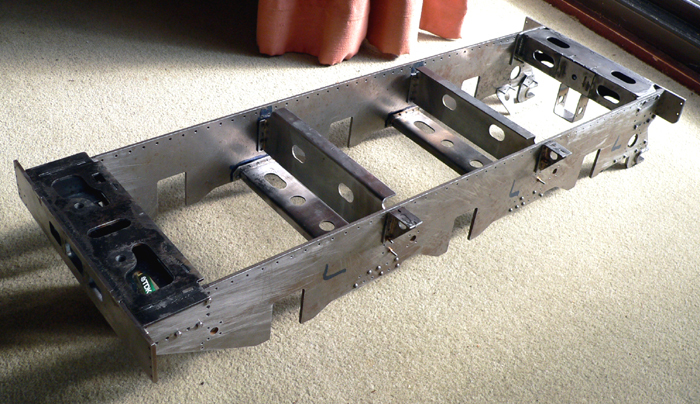 The front bogie stretcher, scaled from the full size object has turned out very well. To a degree, knowing that flat parts can be cut by machine, I've almost been able to design pieces of 'origami' in steel, becoming more adventurous in what can be folded from one piece; then passing the design on to Stefan to interpret in cad ! The beauty of his 3d design is that by seeing items 'in context' and being able to 'rotate' them, obvious errors like gaps or overlaps can be spotted. The abilty to design in 3d on a computer eludes me; so I'll probably stick with paper and pen, but so far Stefan has been very accomodating with suggested design changes . . . Update, some years on I have now mastered the art of 3D design, and would recommend having a look at Fusion 360, (at the time of writing) without charge to hobbyists like model engineers. But whilst all the stretchers have now been drawn out, cut and built up now, quite how the oil bath will be made completely oil-tight is yet be figured out. With an unwelcome pay cut looming, I decided the boiler must be a priority, something I did not have the time or desire to build. I set about designing the boiler for 'Bude' based on the Ariel design, but reducing the firebox length to suit a West Country. Noteable to the period of 1948 is the siting of the 3 safety valves, which were set ahead of the dome, similar to the early Merchant Navy examples. In full size, the forward location of these seemed prone to water surging under braking, so from 1952 as locos went into overhaul, the boiler working pressure was reduced to 260 psi, while the safety valves became just two, relocated behind the dome. I was curious about what happened to the original holes, and found the answer while looking over the boiler for 'Sir Keith Park' at Herston works; the holes just had blanking plates bolted over them, and new holes were cut in the revised location. For the model, the safety valve bushes have been fitted from the inside to allow them to sit slightly lower, as the safety valve tops should be flush with the boiler casing; and I shall be fitting stubby pop safety valves as made by Dave Noble. Also, the water gauge bushes have been repositioned from the Ariel design, and I found the dome needed relocating; so my boiler now has a proper length middle taper barrel, with the dome sat centrally. The boiler was built for me by Roger Radbourne (Priory Boilers) and he made a brilliant job of it; I just can't get over how heavy it is ! So at least that's one major component completed, one I would find more difficult to afford now. From the start I realised there is limited room in the loco for an axle driven pump, but am still in 2 minds about fitting a tender driven pump. There is no doubt that having a feed pump does reduce the constant use of, and reliance on injectors. 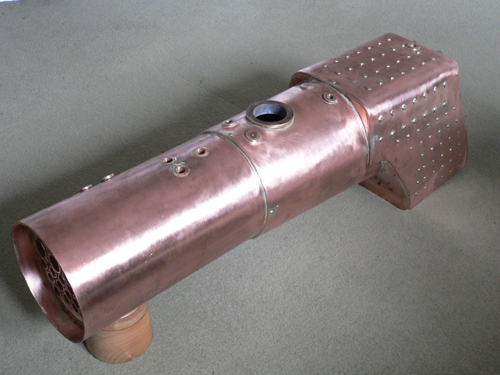 The West Country's smokebox is concealed behind the smoke deflectors, then the cladding. In stark contrast to the more standard type of rolled smokebox fitted to the rebuilds, the smokebox of the original is broadly an octagonal shape. It was one of those tricky items to interpret and took a number of evenings to draw; but once done the parts were cut by water-jet. I decided on using stainless steel which is much easier to 'tig' weld as the electrical current required is less, so a reduced chance of distortion; but probably a pig to paint satisfactorily ! The panels were designed to tab into each other, and the photo shows them just slotted together. I ordered the Ariel smokebox door casting from M.J. Engineering, and on finally receiving it, I found the K.W. designed door almost fell through the scale size opening of the font panel - now that was not expected ! O.K. - fast forward a number of months, and a replacement front panel was digitally cut with a smaller hole to suit the door casting (not that you'd notice). Then a number of hammer blows and a friendly folding machine later, and the loosely tabbed together rough shape became recognisable. However as the bottom panel needed to be fitted around the top of the centre cylinder, it could not be welded up until that was sorted. The brass tender panels and bulkheads were cut out by water-jet from 18g brass, by Luffman Engineering, working from my .dxf drawings. Cutting large sheets by hand and getting them dead straight can be a bit tricky, so this ensured all the curves and edges are nicely identical; but it was also an excuse to try the process for myself. They made a smashing job using my brass sheet very economically, and I couldn't believe the slimness of the cut line. On the Queen's Jubilee weekend - a very wet one in Devon, I started work on the tender body. With pre-cut panels I thought it could be roughly assembled in a week or so. That turned out to be a poor estimate, or maybe a case of wandering from the script . . ? I decided to add an extra 2 internal bulkheads, and having seen the internals of a full size tender, also opted to put in cut outs - though not particularly to scale. This was all shaped by hand and took far longer than anticipated. The brass well tank was tig welded by a friend, and it turned out so well I asked if he could weld the tank to the soleplate. That turned out to be not such a good idea as the larger flat area warped dramatically from the high heat generated by the weld, and required lengths of large angle to keep the outside edges flat. Another lesson learnt ! 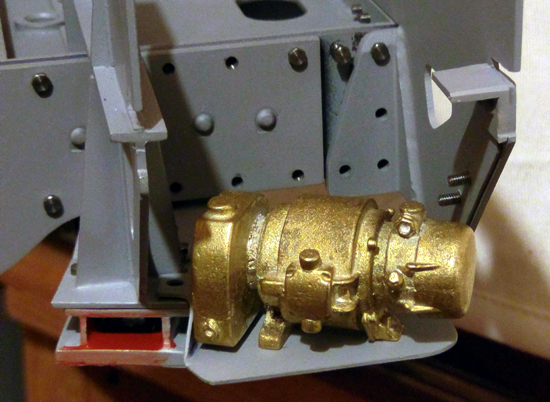 Assembling the tender has consumed 1/4" brass angle - and unlike the Q1 tender, the coal hopper is effectively a sealed tank within the outer sealed tank, so lots of joints to make water-tight using soft solder. I chose to mount the emergency hand pump sideways within the tender ( I hate seeing a loco rock forwards and backwards when these pumps are in use ). The operating slot for the pump handle is hidden under the vacuum tanks located behind the coal area; mounted on a lift out section. 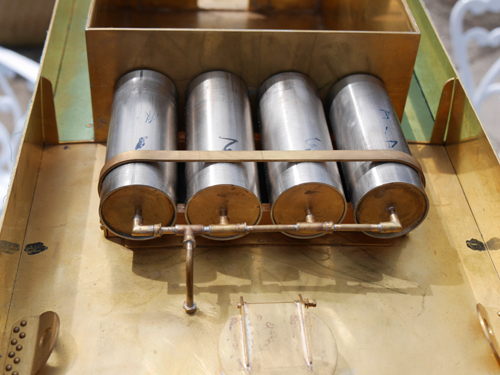 The tanks are mounted on timber runners as per full size, held in place with a wrapper band made of brass. The two blue marks in the photo of the vaccum tanks denote where drain pipes will be located - they go right through the tank. As I am not a professional engineer, tackling a job like machining the cylinders makes me hesitant; but having recently bored a cylinder block for another loco gave me a little confidence. I double checked that the casting was not undersize to the drawing. In my own case a separate backing plate is used to mount the bock onto the frames; and although I'm not using the 'Ariel' cylinder, the dimensions are similar excepting that the bores are reduced to 1 7/16" as suits the 16 3/8" bore of a full size 'light pacific'. Next I machined some wooden bungs to place in the cores of the casting so I could mark the cylinder bore centres as best I could. This was to allow me to determine how much would need to be machined off the bolting face. 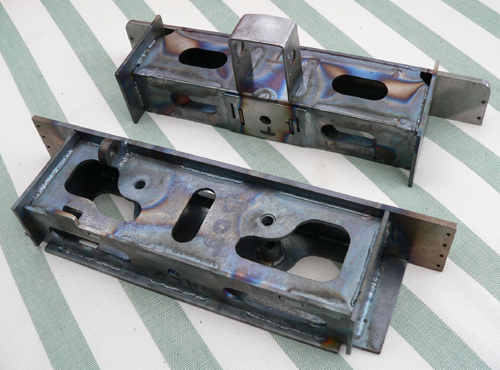 The first machining job was to square off the bolting face to the main frames. Fortunately on the Bulleid pacifics the piston valves are vertically in-line with the main cylinder bores. 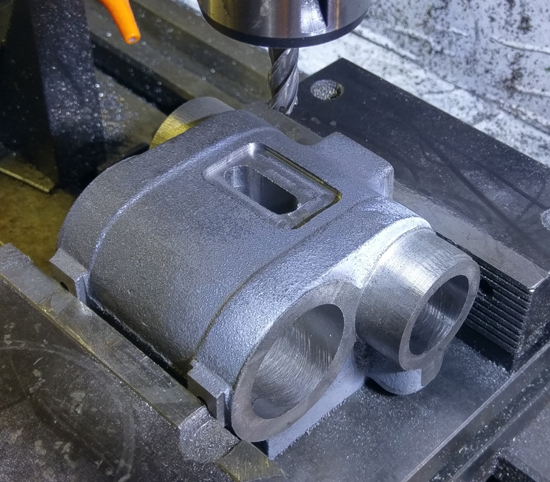 This means I could set up the unmachined cyliner casting in the 4 jaw chuck on the lathe, the jaws being just about deep enough to hold it securely (though I also supported it using the tailstock). 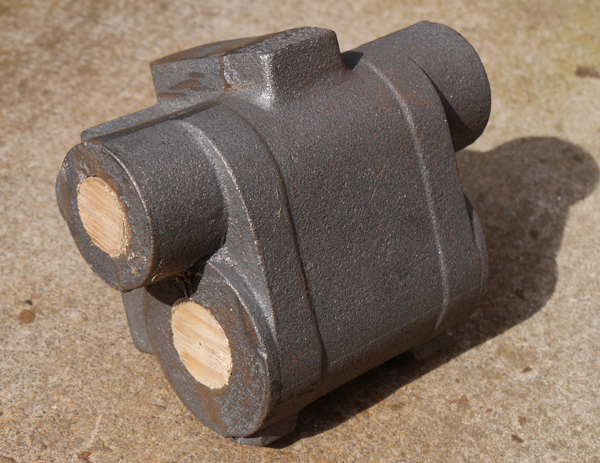 I had previously marked notional bore centre marks on the wood bungs, based on the shape of the casting, so using a small laser I was able to rotate the casting and adjust the position of the block, packing it out until the laser passed as close as possible to all the centre marks. Then the bolting face was turned; and the exercise repeated for the second cylinder. After that, each outside cylinder was mounted on the saddle of my ML7R lathe, suitable packed to height, and the bores were turned using a series of sturdy home made boring bars. Fast forward a while, to one scary job that builders of Ariel don't have to face. In the rebuilt Pacifics, the piston valve was modified to be driven directly through the end cover, in the manner of most locos with external valve gear. However in Bulleid's original scheme, the piston valve is actuated by an arm driven by a shaft coming sideways through the cylinder. 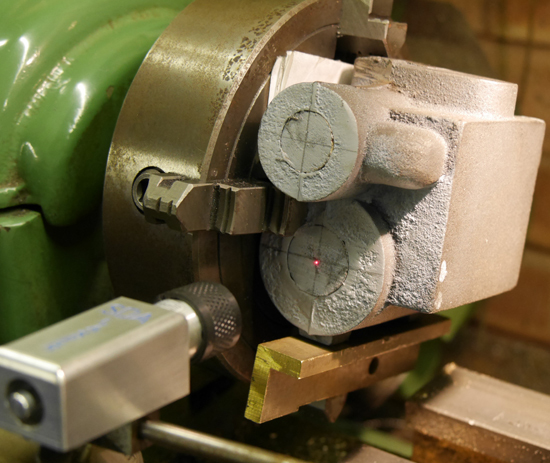 Further the arm has to be inserted from outside which means drilling for the shaft between the cylinder and piston valve bores, then milling out an opening 3/8" wide to allow the arm to be inserted. The measurements for this were definitely doubled checked for fear of breaking into the main bore. Having drilled the hole through, I made the school boy error of thinking I could hold an endmill in the drill chuck to cut the cover recess; but they never hold tight enough, and it nearly caused lots of damage. I then switched to a collet check, and despite a glitch on the electrics of my mill throwing out the DRO, the job went ok, but it was a relief to complete this for both cylinders. Finally I got around to properly assembling the frames. I did attempt this a few years before, assuming that it would be straight forward; but trying to keep it flat on the drilling machine with such long frames was not a recipe for success. So a bit of workshop re-organinsing was duly undertaken, moving a good sized surface plate I had bought from a fellow club member and never really used, to an area of the bench which allowed room either side for long work. However even using that, initially the frames still put up a fight to stay square. Originally I had intended to use mainly 9ba threads, but in the end have adaopted 8ba for all stretcher fixing, but will use bolts with a smaller head from EKP supplies. Using CAD, Stefan kindly modelled a 'Stones' generator, which was then 3D printed by Quenton. I am fortunate to have a local lost wax caster, who has produced a number of items over the years, and he was able to produce a couple of nice examples of the generator. Using a cardboard template, I cut out and folded a thin generator tray that sits between the truck suspension beam and the rear cab floor support; in full size the tray was welded in place, though mine is bolted, and the generator sits on it quite nicely. As there are twelve lamps to make, to allow for a degree of detail, I made a pattern for the 'Bulleid electric lamp'. These were also lost wax cast locally, and although they can clamp to the the lamp brackets, for those fitted to the tender, I have popped a screw through the rear face into the the tender body. One or two front lamps may be fitted with a LED, and I have managed to find some LEDS with a gentle glow, whereas most tend to be too modern (bright) in their intensity; but have yet to solve where to hide the batteries. Similarly, I did want to experiment with U.V. lighting in the cab as originally fitted to the class (though all removed now); but mimicing 'black' gauge faces at a scale size could be 'fun'. The 'Bude' crests, scroll and smokebox ring were commissioned from Diane Carney, to a good level of detail, and while I have now filed them out to shape, I've not managed to paint them; they are a bit fiddly. However with acres of challenges still ahead, they will not be needed for a while yet . . .